From 6:00-9:00, tonight and tomorrow, head to one of WeLoveBeantown’s favorite Dives We-Hate-to-Love, Hong Kong, for some fantastic karaoke and Boston Love. Hong Kong’s resident Karaoke King will be selling BostonStrong and #BelieveInBoston bracelets for only $3. All proceeds from the bracelet sales will be donated to the OneFund! Remember we are all One Boston, and this is just another way to support those affected by the tragic events of the marathon bombings. To donate via text (AT&T customers): Text BOSTON to 80108 to give $10. The donation will be charged on your monthly AT&T bill. Too soon after St. Patty’s weekend? Nah. Technically it’s spring now. And although its 20 degrees out and you may still be hungover from Sunday, it’s time to buck up and start training. No, not for the Boston Marathon in April – although Marathon Monday is kind of your next opportunity for citywide “merriment” – but for spring and summer festivities in Boston. The world of outdoor dining will be back. Patios will open. Picnics will be had. We will be able to extricate ourselves from those windowless dive bars we spend our winters in. Speaking of dive bars, which of the Shite Sixteen did you have green beer at this past weekend? 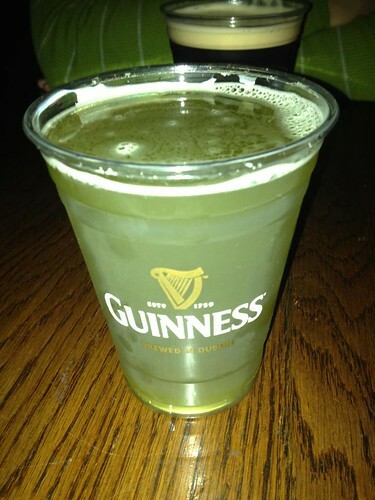 We know you celebrated the luck o’ the Irish. Now post yer photos to the We Love Beantown Flickr page! Wait a second, we have jobs? And these jobs look down on old school good times of yesteryear? Maybe we can shrink a week in Florida into two days, and take the rest of Beantown with us.